If you are planning to install a Photovoltaic Solar Energy System, then figure out how much solar energy you can expect your panels to absorb, based on the average daily solar radiation for your area. For most parts of the United States, an average of 4-5 kWh/m²/day can be achieved, though in some regions it is possible to achieve up to 8. To find the output for your area, please refer to this map put out by the National Renewable Energy Laboratory (NREL) Resource Assessment Program. In the delineation kWh/m²/day, the kWh stands for kilowatt hour, with “m” being the area of the absorber, or in this case, the photovoltaic cell, put into square meters. Solar panels, on average, work at about 7 to 17% efficiency. Therefore, if you live in an area with an average solar radiation of 4.5 kWh/m²/day, and you have a total surface area of 1 m² (corresponding to 1.55 squared inches) of photovoltaic cells, you can expect to generate 0.315 kWh/day (315 Watt/day) estimating an average solar panel efficiency of 7%. Once you know how much energy you can expect to get from the sun, you can determine about how much energy you will need based on your current monthly energy consumption. If you don’t have copies of your last 12 bills, you can view the state by state averages, as published by the Energy Information Administration here. According to the chart, a consumer who lives in New Jersey, for instance, will use an average of about 730 kWh/month in electricity, while one in Alabama may use as much as 1300 kWh of energy per month. Now that you know how much solar radiation is available and how much of it can actually be utilized by a solar panel, you can calculate how many photovoltaic solar panels you will need in order to replace your current source of electricity. You will need to find out the exact size of each cell in square meters, as well, which can probably be found on the website of, or in literature from, your manufacturer of choice. If we assume an average energy usage of 1000 kWh per month, we will calculate: “Solar radiation” x “Surface area of the panels in m² ” x “0.07” (7% Estimated solar panel efficiency) x “Average days per month” (365/12). We will then divide that number into 1000 (The average energy usage of 1000 kWh per month). 5 (Solar Radiation) x 2 (Surface Area of standard solar panels) x 0.07 (Solar Panel Efficiency) x 30.42 (Average n° of days per month) = 21.294 kWh produced per panel each month. 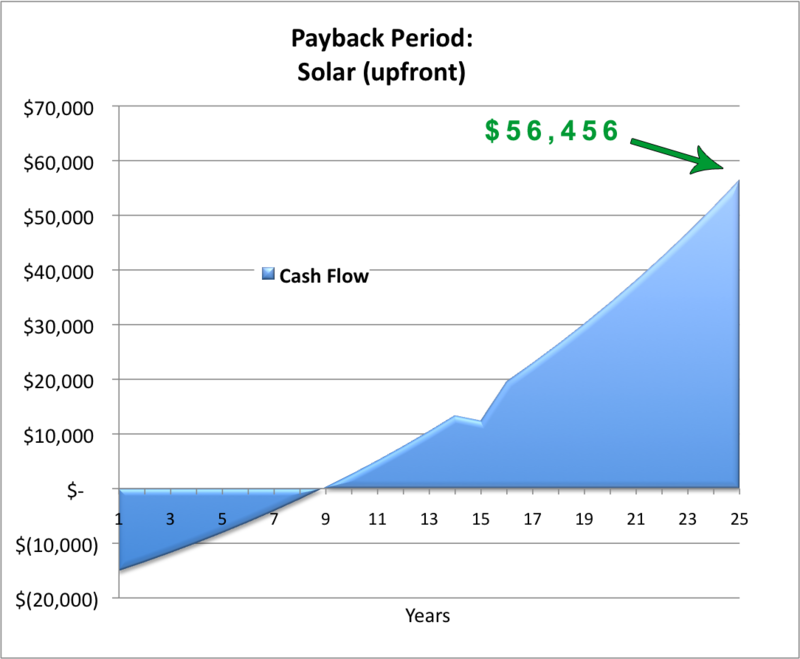 For nearly everyone, the upfront cost of a photovoltaic solar system will be a major factor. However, with the yearly utility savings and the government incentives, it can be well worth the initial investment. A lot will depend on the size of the system you install. Considering a single 2 m² of solar panel can generate 21.294 kWh/month and your electricity company charges an average of 20 cents per kWh, you would save about $51.2/year. 10 x 2 m² Solar panels could let you save 512 $ /year. If that system costs $20,000 and solar Governmental rebates / Tax Credits may let you cover/cut the cost by 50%, you’ll have to payback 10,000 $. It would take you about 19.5 years for 10 x 2 m² solar panels to pay off the system and begin truly saving (if you consume 1,000 Kw /Month it will cover at 50% your energy bill). In areas where the kWh cost is higher, the savings and pay-off period could be significantly reduced, allowing you to pay off the system in less years. Here you can read more about the cost of solar panels, find all solar energy incentives here and find more info about solar leasing. How do I sell Solar Energy to a Utility Company? This is available for grid tied solar systems. If you’ve taken or are thinking of taking the energy-efficient step of installing solar power at your home or business, know that this move can be cost-effective, too. The initial investment for a solar panel system can be quickly paid for by selling your surplus energy to a utility company. The government requires 42 states and the District of Columbia to purchase surplus power from consumers. The way to take advantage of this process, and the subsequent rate you will receive for your surplus energy, varies by state. Here is a quick guide to getting the most out of your extra solar generated energy. Here more on how to sell solar energy to a utility company and how much to sell energy back to the grid. If the southward facing roof on which the panels will be installed is slanted beyond the angle of your area’s latitude, then the panels should be lifted at the bottom edges, in order to achieve the best radiation angle, whenever possible. For flat roofs, any of the four sides can be elevated to match the latitude angle. Here you can read more tips to find solar installers and photovoltaic system reviews. We are bidding for big Government project to supply different size of Solar systems for both Domestic and Commercial use the scope still not clear, but from our resources/Network it is very big one. I would like please to start making contact with you about your Solar products and also services you provide after sale. I will like to get a quotation for a solar system to provide 150 kWh per month (panels and energy storage unit). I greatly appreciate your assistance and look forward to your response. can we have energy from solar panels in the indoor environments from lighting to move electromechanical system? actually i have an idea in marketing communications and i need to have a mobile solution without electrical wires. simply i need a power to move a robotic hand that it will move up and down or maybe many other movements. Solar panel from 50 to 250watt. Please reply back soon,to let us know if you have any of it in stock,if yes,please advise unit cost for each. And will like to know if you accept credit card payment. I am interested in purchasing solar panels to offset my electricity costs… In my part of the country humidity & non-airflow is the worst! The air-conditioning is our largest electricity usage. I would like to store power during the sun hours to offset peak usage during afternoon hours. Suggestions?